One more trivia question since I’m feeling too hot and lazy to review a film today. Who is this actress? She was a child star who successfully transitioned into adult roles, although for some incomprehensible reason she was always in a supporting role and not a heroine (as you can see, she is beautiful, and a good actress to boot!). 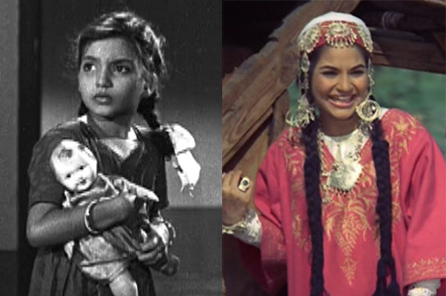 v9y, madhu and rum all knew that this is Kumari Naaz, also known as “Baby Naaz” and “Naaz”…the screen cap on the left is from Boot Polish, and the one on the right from Raja Saab. Posted on July 9, 2008 at 11:40 am in Hindi movies, Trivia time	| RSS feed You can skip to the end and leave a reply. Although I can barely recognize her in the b/w photo, by the one on the right I can tell that she is N***. She was adorable in both her baby version and later in adult roles. I especially remember her sparkling eyes in the Boot Polish song “nanhe munhe bachche terii muTThii me.n kyaa hai”. is that baby naaz from kaagaz ke phool and boot polish? Yes, you are all right; it’s Kumari Naaz, also known as “Baby Naaz” and then just plain old “Naaz”. She was a pretty child and a beautiful woman. I’ve never seen her before (I think), but she is definitely pretty enough to be in a lead role – is it possible if you could post more pictures of her? By the way, which movie is the grown-up picture of hers from? I know I’ve seen this movie – I remember the Kashmiri costume – but I’m not sure which one it was. Jab Jab Phool Khile? The reason you didn’t see more of her is that she hated being an actress. At least that’s what I remember her saying in a documentary on child actors – that she hated the film world, wanted to study and become a doctor, but her parents pushed her into acting because it was a quicker and easier way for the family to get money. She was quite bitter about it. It’s a documentary film made in late 1980s/early 1990. Haven’t seen it but got a detailed article about this film in a magazine published by NFDC. Ooh I would love to read that! Do you have a link? Have you posted the article on your blog? I will scan it and email you. I have another screen cap of her in my post on the film Preetam, where she played Mehmood’s love interest. Thanks for the information about her; how sad that she hated acting and was pushed into it. I hope she found happiness after she quit films. As far as I know, she hated acting as a child, but preffered it after she was grown up. She dubbed for Sridevi, when she was new in the Bombay Hindi Film Industry. I remember an interview with Naaz, where she refers to Sridevi as her Laxmidevi, since she pepped up her bank account! she was great in boot polish. clearly she is not in films now.hope she is doing well wherever she is. I do too! Naaz, where are you???? I always thought Naaz grew up to be an attractive woman. I read somewhere that she died of cancer in the 80s. Hopefully someone else knows for sure when because I’m pretty certain she’s no longer living. I would like to make it clear (to Siggy) that Actress Naaz (Baby Naaz, who worked in Kaagaz Ke Phool as Guru Dutt saahab’s duaughter) is very much alive and staying in the rented bungalow of Asha Bhosle ji on the second floor. And, please for God sake, don’t create rumours until-n-unless you are not aware of the facts. I just read that she lived there after the kerfluffle her downstairs neighbor Sadhana is having with someone who wants to take over her apartment or something. Was very happy to hear it :) Hope she is living a happy and contented life! My mistake I did not realize and I was not creating rumours. So I was proven wrong my facts were not accurate. Sorry if I offended anyone. Hello All! Actress Naaz is alive and staying in rented bungalow of Asha Bhosle ji on the second floor (actress Sadhana ji stays on the ground floor). Glad to learn about Naaz.Would be interested to know latest about Kalpana. She acted in a few films.Was heroine opposite Shammi Kapur in Professor. Heard she had married a popular columnist and then quit films. Rattan Kumar moved to Pakistan and did a few lead roles there. Praveen had a pretty long career of playing second fiddle to the heroine, or heroine in B movies. I wonder what happened to her too! Komilla Wirk (Ishq, ishq, ishq) did well. Married to a Brit, Komilla Wirk Sutton, is an established and well known astrologer in the UK. She is good too. Check her out on the net. Her acting in Boot Polish was mind boggling…..
She acted in Sacha Jhhota as Rajesh Khanna’s sister.